All Malkovich's Eve - 9th December, day of thankfulness and worship. alphabet malk - a malk-game in which as each letter of the alphabet is listed, players must find a malk-associated word to correspond to the letters...eg. A - athos, B- Biff, C - Cyrus, D- Death of a Salesman etc. Al Rockoff Syndrome - a condition in which the subject runs around witha camera, pretending to be Malkovich as Rockoff, characterised by hanging lenses and cameras around one's neck and refusing to eat oysters. amalk - not or without Malkovich eg. "I find there is no point in seeing amalkfilms"
Anima naturaliter Malkovichiana- (Lat.) a soul that is, by its nature, Malkovichian. anglomalk - Malkovich affecting an English accent and mannerisms. anno Malkovich - (Lat.) 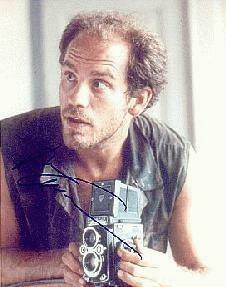 the year of our Malkovich eg. "tis now Anno Malkovich 46"
Anorexia malkosa - (Med.) an eating disorder characterised by an irrational pursuit of Malkovich . Subject experiences an irrational compulsion to consume only foods which have some relation to Him. eg. jello, spaghetti, boiledwater, potato, oreo cookie eating. 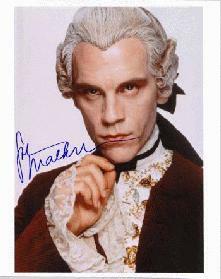 antemalk - (n) before Malkovich appears eg. "In my anticipation, I fast-forwarded all of the antemalk"
Anterograde malknesia - (med.) An impaired ability to form long-term memory for new information that is not Malkovich related. apomalk - the furtherest possible point away from Malkovich eg. "Being in the southern hemisphere, I feel so apomalk..."
Athosism- (n) 1. a practise in which one is cavalier, waxes lyrical and uses asword that is far too heavy for them. 2. Another subset of Malkomania, where one is enamoured of Athos. Ave, Malkoturi te Salutant -(Lat.) Hail, those who are about to Malk salute you! Aut Malk aut nihil - (Lat.) Either Malkovich or nothing!